New Junior Girl Scout Badge Workshop! CALLING ALL JUNIOR GIRL SCOUTS!Our Junior Drawing Creativity Workshop will gather Girl Scouts (8-11 years old) from many troops for imaginative collaboration. 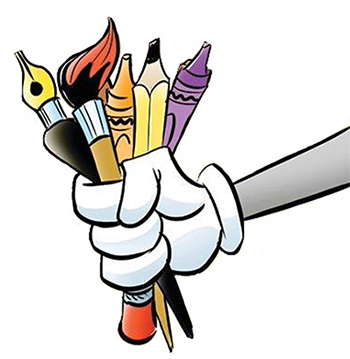 You'll experiment with tools as you learn to draw some of Chuck's most famous characters. You'll use your imagination to create a unique character. And you'll learn hands-on techniques that bring your character to life with shading and perspective. Our teaching artists will guide scouts toward earning a drawing badge wiht content relevant to Girl Scouts requirements. $25 per scout. All materials are included. This class is scheduled for Sunday, January 8, 2017 from 1 to 4 PM. Click here to purchase this class. Girls Scout Troops 549 and 26 earned their Junior Drawing Badge at the Center! We thank our Teaching Artists, Jennifer "Jejo" Sleeper and Deborah "Debbie" Sleeper, for leading the class with grace and wit! Are you interested in earning your Drawing Badge at the Chuck Jones Center for Creativity? Contact Sasha Advani at Sasha@ChuckJonesCenter.org or (949) 660-7793 x107 today!